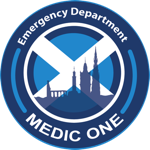 The Edinburgh ED Simulation Team was set-up in August 2013 and is led by Consultants Dr Shirin Brady and Dr Craig Walker. The Faculty also includes Dr Gareth Clegg and senior nursing staff Ian Lee, Caroline Hughes, Jan Gilchrist and Leigh Brown. We aim to further enhance the strong knowledge base and working relationships between our medical and nursing teams through clinical skills and drills training along with high- and medium-fidelity simulations around potentially challenging clinical scenarios. (1) High-fidelity Simulation: 3-4 times per year. We take 2 Resus teams through real-time, challenging clinical scenarios (including Major Haemorrhages, Rapid Sequence Intubations, Surgical Airways and ED Thoracotomies, amongst many others). These sessions take place in our own Resuscitation Rooms which increases realism, allows us to use all our own equipment, streamline our processes and further improve our working environment. We have installed video links between our Resuscitation and ED Teaching areas and employ a variety of feedback and debriefing methods, including video debriefs. (2) Medium-fidelity Simulation: "Resus Fridays". In early 2014, we will commence once-weekly clinical skills and drills training in our Resuscitations Rooms. These are aimed at all grades of the ED Medical and Nursing workforce and, rather than running full simulation scenarios from start to finish, we will be training using bite-sized / condensed topics such as invasive lines, use of rapid infusion devices, non-invasive ventilation (NIV), chest drains, splint application, ventilator troubleshooting, cardiac arrest devices and many, many others. These will be predominantly hands-on sessions, teaching not only the theory behind each topic but also training in how to use our equipment in the most effect ways possible. The potential for our simulation training is huge. We have a tremendous opportunity to improve everything from our individual knowledge bases and practical skills, the equipment we use and how we use it to the very design of our Resuscitation areas. We look forward to working and training with you. Older PostWho Needs a Redirection Policy?